We have a lot to talk about, gratitude, celebration, hope, dreams and beyond. 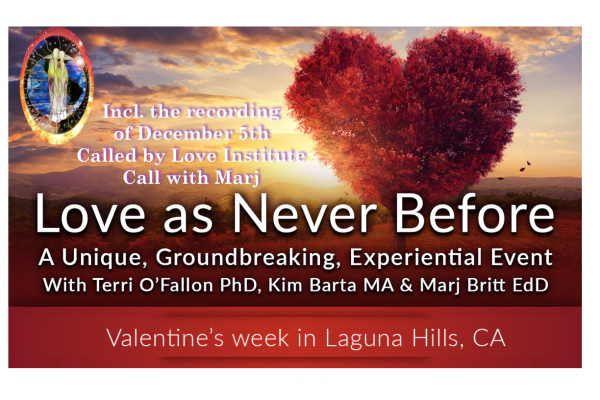 I’ll be sharing more about our ‘LOVE AS NEVER BEFORE’ live workshop and gathering with pre-event possibilities that is coming during Valentine’s week in February. In case you missed it, you can read my earlier message below. You are so important in these moments of seeing into the Vastness! Love continues to Reveal Itself, Forever and Always. We are entering our 8th year of Called By Love! The number 7 represents completion on the human plane. The number 8 is an Infinity symbol. It is the beginning of movement to completion on the Spiritual plane, symbolized by the number 12. It is time to Celebrate and Honor all that has happened and All that is to come! And it is so significant for me. I have seen it and felt the yearning for it for three years! We are delighted to announce a UNIQUE IN-PERSON LIVE WORKSHOP that we are co-hosting with Stages International in February, 2019. It is a huge honor for me to be co-leading, planning and teaching with Terri O’Fallon, the founder of the Stages Inventory, and Kim Barta, her brother and co-founder of Stages International. Terri O’Fallon’s work and research goes beyond any of the work I’ve studied for so many years, especially as the research relates to the late and still rare stages of development. It has been, for me, the cutting edge coming into clarity, vision revealing itself, opening me into next steps. It has been unknowing moving into clear seeing, even while still in the Invisible. 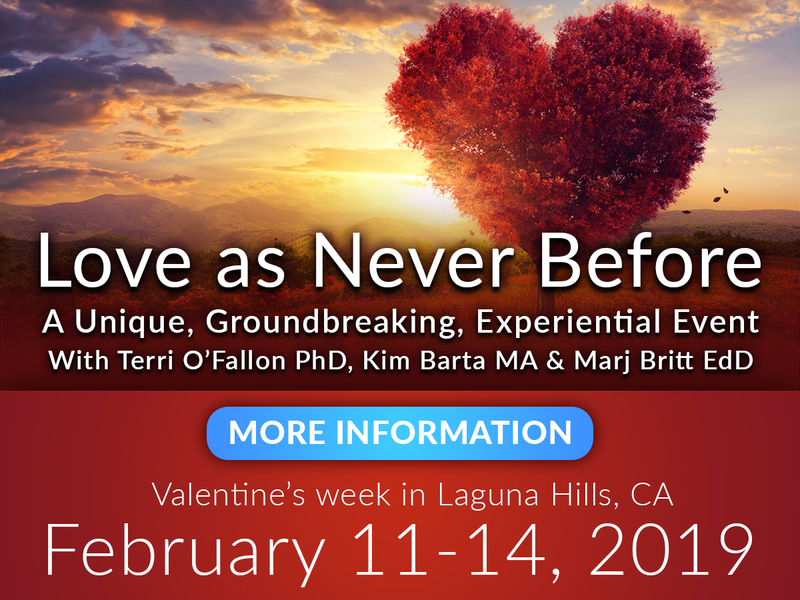 I really want to share this break-through awareness with you.LOVE AS NEVER BEFORE will explore Love in ways that you’ve never experienced it before. This is human love and Soul Love, both/and. It will open into a Quantum Leap in how you understand Love in your life. Please visit the workshop registration page to view the detailed workshop program and for information about travel and accommodations. We invite you to participate in this unique workshop from February 11-14 where we will explore and learn about how love grows up. Be sure to register by January 14 and save $100 with the early bird price. There is also 15% senior discount. Also, you will notice on the page that partial scholarships are available to ensure all who wish to attend can be part of the event.